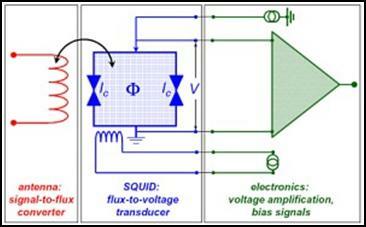 SQUID is an acronym for Superconducting Quantum Interference Device. It is a very sensitive magnetometer which measures small/weak magnetic fields very accurately. The sensitivity of the SQUID is linked to measuring the changes in the magnetic field corresponding to one flux quantum. The principle behind SQUID was discovered by a theoretical physicist, Brian Josephson in 1962 at the University of Cambridge while pursuing his Ph.D.. In a SQUID, two superconductors are separated by thin insulating layers. At the junction, a current will flow without any voltage drop. If there is a voltage drop, the current will oscillate at a frequency in sync to the voltage and this is linked to the magnetic field. This superconductor junction is called as Josephson junction & effect is called a Josephson effect. Now as the current density through a weak electric contact between the two superconductors depends on the phase difference ‘Δφ’ of the two superconducting wave functions – the time derivative of Δφ is correlated with the voltage and is used for sensing via electronic circuitry as shown below. The following video gives a better idea regarding SQUID along with the sample loading & movement along the pickup coil which disrupts the magnetic field of the Josephson junction.